Category Archives: Albert Hammond Jr.
After the Strokes’ overwrought third album, 2006’s First Impressions of Earth, the band decided to take a break from the nearly five to six years of constant touring and recording to rejuvenate. Of course, this did not turn out to be entirely true as later in 2006, rhythm and occasional lead guitarist Albert Hammond, Jr. released Yours To Keep, a surprising and unexpected entry to the Strokes’ canon. 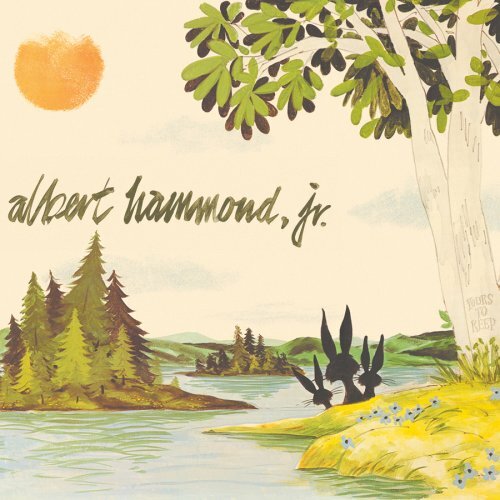 To be clear, though, Hammond’s music is far removed from the sound of his day job; a cover of Buddy Holly’s “Well…All Right” may give one an idea of the direction he heads on this album. Hammond trades in sunny pop where even when things can get a little claustrophobic such as on “Scared” (“I know you’re still there because you’re scared that you’ll lose everybody”), there is always light at the end of the tunnel. Much of this has to do with Hammond’s voice as it does with his charming, unaffected melodies. His sweet, genuine delivery gives his lyrics a different tone than the Strokes, even if a few of the lines sound like Julian Casablancas could have written them. Elsewhere, album opener “Cartoon Music For Superheroes”, a song that sounds like an outtake from Pet Sounds and “Hard To Live In The City”‘s brass band closer show off the album’s unpretentious eclecticism. Yours To Keep is an unexpected surprise that will most likely win over many fans who do not find room in their taste for the Strokes. Posted in Albert Hammond Jr.